In mid-November last year, Fednav (Belgium) N.V., welcomed its next-generation vessel, the Federal Bering at the Port of Antwerp. A reception was held on board to celebrate its maiden voyage to the largest Belgian port. Best known in Antwerp for its FALLine liner service from Europe to the Great Lakes, Fednav currently has a newbuilding programme that will see 19 new Handysize Lakers specially designed for the St. Lawrence Seaway and Great Lakes delivered between 2015 and 2018. 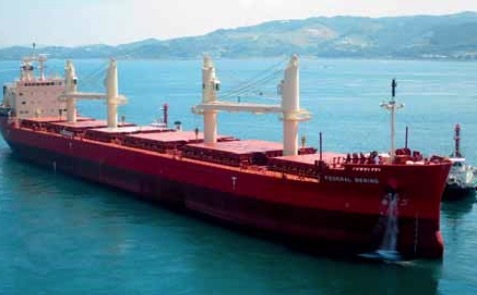 With 52 Handysize Lakers, Fednav, which operates one of the most modern fleets of bulk carriers in the world, will continue to offer customers a regular and reliable service from Europe to North America. Built at the Oshima shipyard in Japan, the Federal Bering and its sister- ships have box-shaped holds in order to facilitate the handling of general cargo. The company’s activities are by no means restricted to the St Lawrence Seaway. With a combination of Handysize, Supramax and Ultramax vessels, Fednav also owns and operates two of the most powerful bulk- carrying icebreakers along with the largest ice-class bulker fleet in the world. “By continuing to expand our fleet and operations, our fleet will be one of the most modern, efficient, and environmentally friendly trading between Europe and North America, especially in the Great Lakes and St. Lawrence Seaway System,” said Etienne De Vel, Commercial Manager of European operations. a CLEAN notation from the DNV/GL classification society. On the vessel’s maiden voyage, the Federal Bering departed the Port of Antwerp transporting mainly steel products and some project cargoes on its way to Chicago and Burns Harbor, Indiana.